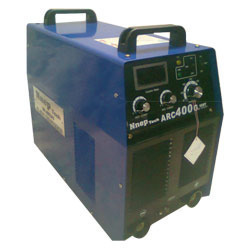 With sincerity and hard work of our professionals, we have carved a niche for ourselves in this domain by offering ARC 400 IGBT Welding Machines. Designed with utmost precision, the offered machines are manufactured using optimum quality components and advanced technology. In addition to this, our offered welding machines undergo various checks under the supervision of quality controllers, in order to ensure their flawlessness. Besides, these are available as per client's specifications.